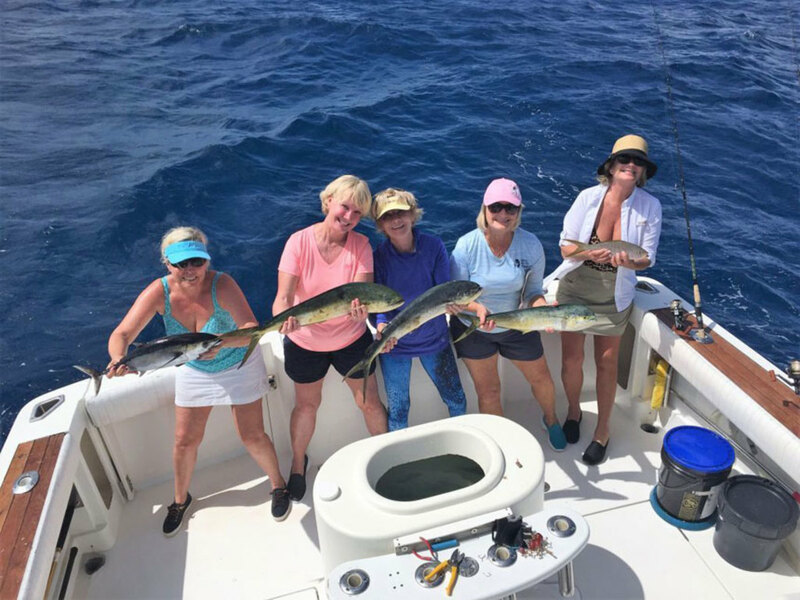 Cindy Campbell (left), Theresa Mathis, Pat Kucera, Janet Steiner and Rebecca Hill are shown with fish they caught on Caribsea at a Ladies, Let’s Go Fishing event in Florida. All are from St. Augustine, Fla., except for Kucera, who is from Clearwater, Fla.
Aspiring anglers from around the country traveled to Ladies, Let’s Go Fishing Keys University Oct. 20-22 at the Elks Lodge in Tavernier, Fla. The event kicked off on Oct. 20 with a meet-and-greet social featuring networking, fundraisers and a master chef appetizer contest. The day also was a bonus fishing day. The following day’s events began with classroom presentations on offshore, bottom and inshore fishing, followed by lunch and hands-on fishing skills until 4 p.m. The speakers were Stu Apte, Allison Stattner, Capt. Gary Ellis, Twig Tolle and Capt. Lee Lavery. Skills such as releasing, conservation, knot tying, bait rigging, spin, fly and net casting and gaffing grapefruits were available for practice. On Oct. 22 participants embarked on a fishing adventure from Whale Harbor Marina, Islamorada, Fla., followed by a fish-fillet demonstration. Fish caught or released included mahi, blackfin tuna, yellowtail snapper, king mackerel, mutton snapper, strawberry grouper, snook, tarpon, black drum, mangrove snapper and sharks.